Combine all the ingredients in a food processor. Form a puree like mixture. Then you can add some more olive oil if you like. 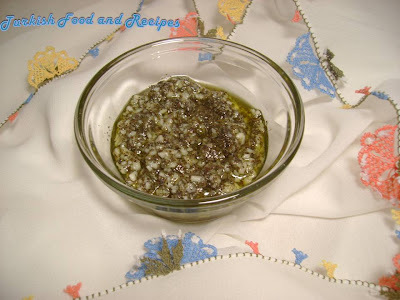 Basil Pesto is a very yummy Italian sauce which is good to go with any kind of pasta and macaroni. 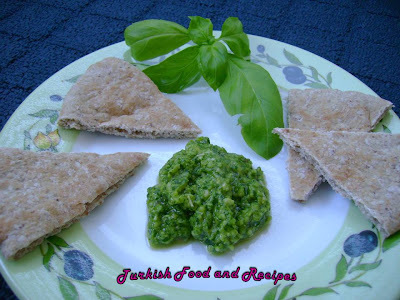 You can store Basil Pesto sealed in the fridge for 3-4 days and also in the freezer up to 2-3 months. Butun malzemeleri rondo/ mutfak robotunda iyice pure kivamina getirin. Isterseniz biraz daha zeytinyagi ilave edebilirsiniz. Feslegenli Pesto sosu makarnalarin uzerine cok yakisan bir Italyan sosudur. Hazirladiginiz sosu agzi kapali olarak buzdolabinda 3-4 gun, buzlukta ise 2-3 ay boyunca muhafa edebilirsiniz.